Carewest encourages resident, client and family feedback to help us address areas needing improvement and recognize good care and service. 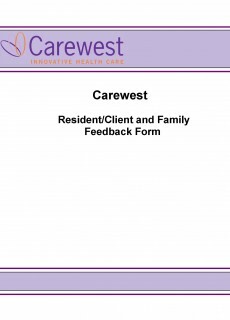 Carewest’s “Resident/Client and Family Feedback Form” is available on each unit to help you document your feedback for follow up with the Client Service Manager. You can either provide your feedback on the Resident/Client and Family Feedback form on the unit, print it off here or simply fill it out online here. If the concern affects the immediate safety of a client, please contact the Client Service Manager directly or, if calling after hours, ask for the Most Responsible Person at the site. If you feel Carewest has not addressed your issue or concern, there are additional resources available through the Alberta Health Services Office of Patient Relations, who can be reached at 1-855-550-2555 or online by clicking here. The Alberta Ombudsman also responds to complaints of unfair treatment by the Patient Concerns Resolution Process and can be reached at 403-297-6185. Carewest does not tolerate abuse of any person in our sites and enforces the Protection for Persons in Care Act (PPCA) that provides protection from abuse for people in our care. That Act requires that anyone who has a reasonable basis to believe someone is being abused must also file a report to that agency. Carewest is committed to engaging its staff, residents and their families to share information, identify opportunities for improvement and make collaborative decisions in order to improve the quality of life for all of our residents. One of the ways this engagement takes place at our sites is through meetings such as Resident Forums, Family Forums, Resident and Family Activity Forums or Resident and Family Councils. A version of the Resident / Family Forums occur at all of our long-term care sites currently. Click here for more information about creating a Resident and Family Council at Carewest.